Pretty much since day one of becoming a homeowner, I have been an advocate of Ecover's greener cleaning products - household products that take their inspiration from nature to deliver effective cleaning without the harsh chemicals. I've had my successes with Ecover, and I've also tried a few of their products that didn't work for me - products which previously couldn't live up to the cleaning challenges I was facing. 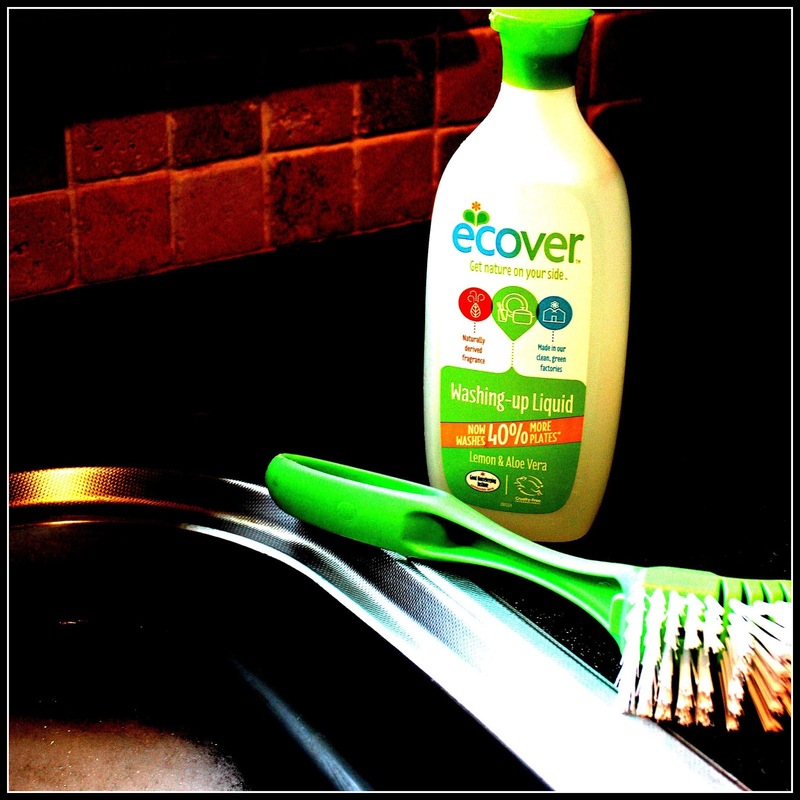 Over the years, Ecover have worked hard to develop powerful cleaning performance using natural ingredients and recently they asked me to try out their new formula of washing up liquid which they claim can wash upto 40% more plates than before. The new improved Ecover washing up liquid is now 99.8% plant-based with clever natural cleaning agents such as sugar and coconut oil instead of petro-chemical detergents. This ticks an awful lot of boxes for me because, if it weren't for the challenge of actually getting glasses and pots CLEAN, I'd really rather do-away with washing up liquid altogether! 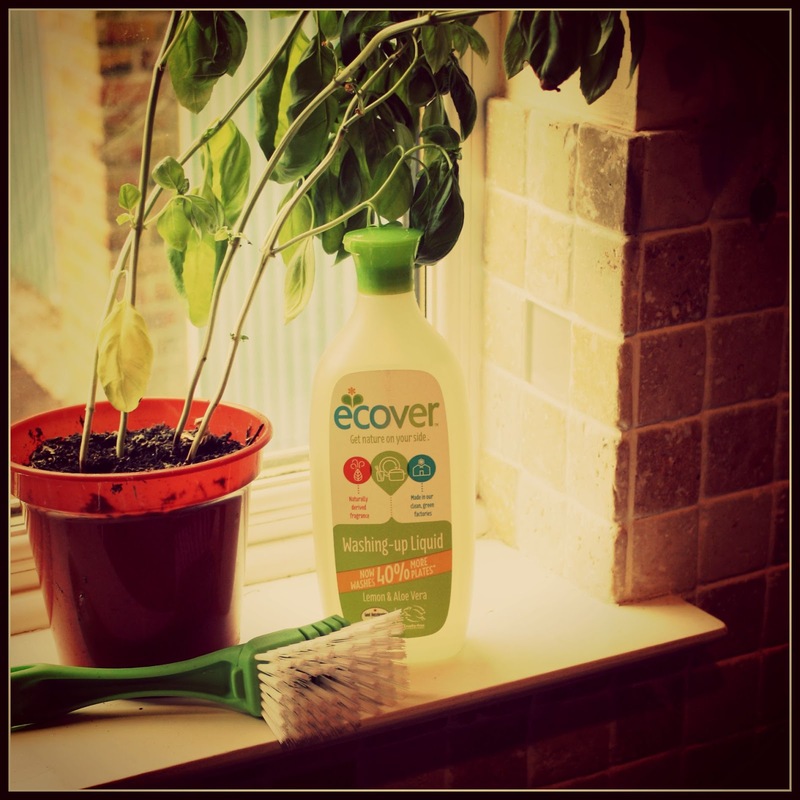 For me, a natural product which can get things really clean is a happy compromise between clean and green. I don't do an awful lot of hand washing up - I really only wash expensive glassware, tupperware boxes and my cafetiere but it is really important to me that these all remain spotless and beautiful. I'd expect a bottle this size to last me the best part of a year as I hardly need to use any of the liquid each time I wash.
Pre-treat food stains with lemon juice before washing so that you don't have to soak in liquid or scrub really hard! Make sure you clean your sink and your washing up-tools before and after use - no point trying to keep your dishes clean with dirty equipment. This also helps to reduce bacteria build up. Baking soda is a great tool for removing dried-on food from dishes before washing - particularly groovy for removing baking residue from cake tins! Dry your dishes with a tea-towel after washing to help reduce water stains. Follow the instructions on your washing up liquid and only use the amount it recommends - more liquid doesn't necessarily mean better cleaning.